Ever After's Wicked Collection is packed with six stunning polishes that vary in finish, complexity and color. Read on to see which one will be your favorite! Dancing Through Life is a creamy gray holo with intense copper shimmer and multi color holo glitters. 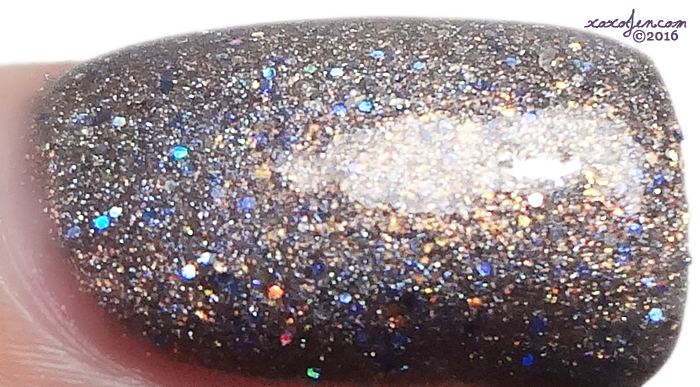 It is absolutely stunning as it flashes goldish/coppery against the gray base and rainbow of holo glitters. It's my favorite in this collection. I wore two coats for opacity and topped with a glossy topcoat. Formula was smooth especially for a glitter bomb! 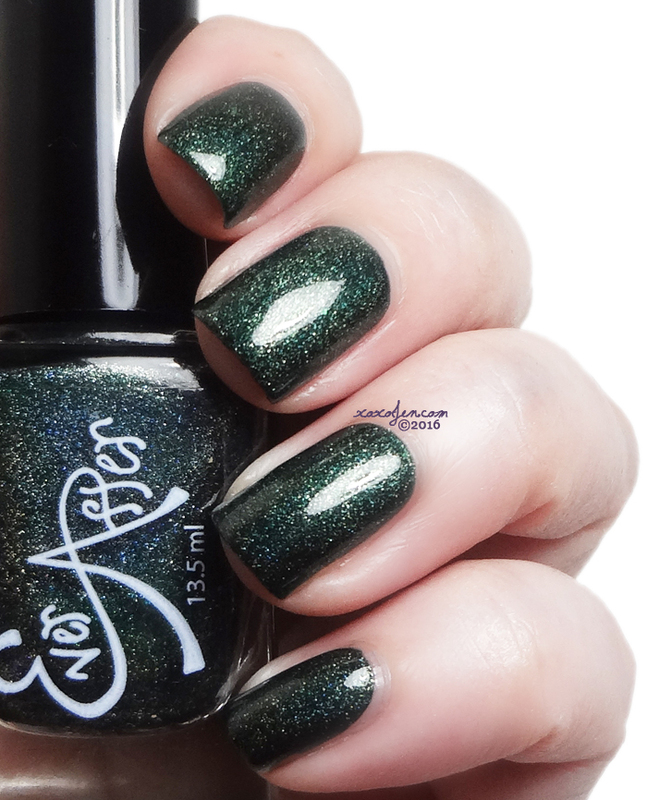 Emerald City is a deep emerald green holo with silver shimmer. It has such depth of color it's easy to get lost in it daydreaming of forests and moss. I wore two coats with topcoat for shine, formula was smooth and easy to apply. 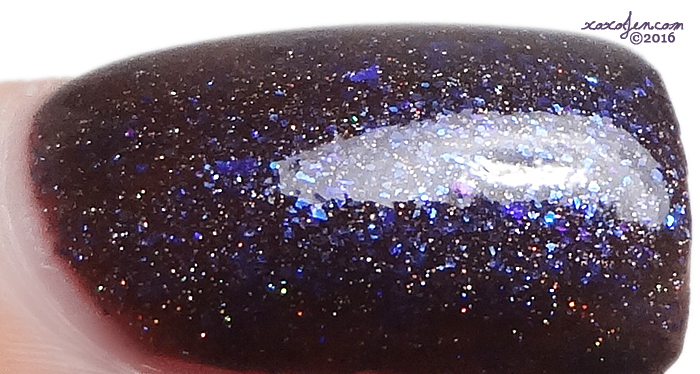 Fly My Pretties Fly is a deep chocolate leaning plum with blue to purple crystal flakes and blue and purple shimmers. Such an unusual combination of colors in this polish adds to its complexity. It's one of those that keep you guessing every time you look at it you see a new aspect. I wore two coats with topcoat, formula was buttery and nice. Popular is a bright pink holo with purple and blue flashes and shimmer. What a fun shade and a shout back to summer as it exits and fall sets in. I wore two coats with topcoat and it had a smooth easy formula. Unadulterated Loathing is a dusty, nearly blue, purple with glitters shimmer and multi color chrome flakes. It has a lot going on and such a fun polish to wear! Two coats and topcoat for this look and it has a smooth easy formula. 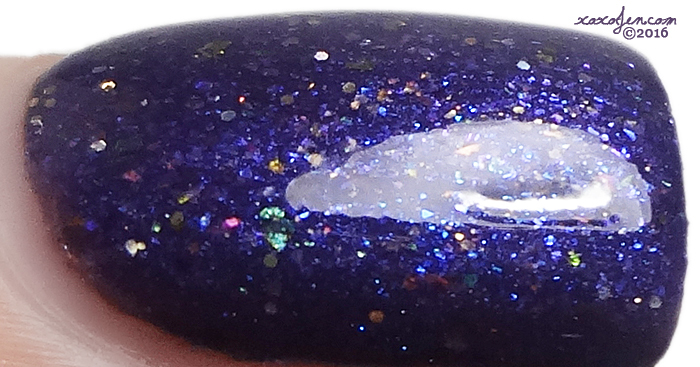 Defying Gravity is a black jelly with green and purple shimmers and flecks with scattered holo sparkle. Dark and mysterious in low light and super sparkly in sunlight. I wore three thin coats with topcoat. The Wicked Collection is available as both a set and individually right now at Ever After's online shop. Ever After Polishes are 5-free and cruelty free unless otherwise specified. All their polishes are mixed in small batches and they do our best to maintain consistency in color, texture and durability. Due to these variables there may be some variations from batch to batch but they strive to keep them minimal. Questions or comments about my review? Please post below!